Midtown Manhattan’s MSR Studios was awash with pink feather boas. The occasion? The recording of the original Broadway cast recording of Priscilla Queen of the Desert, the international hit music making its debut on the main stem next month at the Palace Theatre, and exeunt was invited along for the ride. Aiming to stay ahead of the curve, the Broadway production recorded its cast album before performances have even begun – a rare feat in an age when many shows are recorded late in their runs, after the show has already closed, or, sometimes, not at all. The show, based on the 1994 film The Adventures of Priscilla, Queen of the Desert, follows transsexual drag performer Bernadette (Tony Sheldon) and her drag queen cohorts, Tick (Will Swenson) and Felicia (Nick Adams), as they trek across the Australian outback toward a job in a distant town. The musical version features over 20 dance-floor hits from the past three decades, a number of which were featured in the original film. As our three central queens draw nearer and nearer their destination, they face violence from a rough-and-tumble gang and learn, by the end of their journey, to accept themselves so that others can accept them as well. 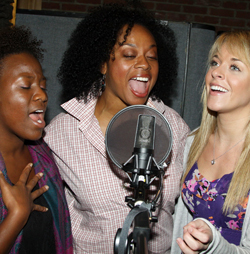 (From L to R) Priscilla’s divas Anastacia McCleskey, Jacqueline B. Arnold, and Ashley Spencer. Photo: Bruce Glikas/Broadway.com.